The Hawx Ultra 90 from Atomic is a great medium flex boot with a high tech Energy backbone for the woman who needs a low volume, narrow fitting boot with 98mm last. 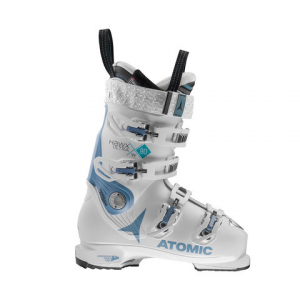 The Hawx series has been one of most popular boot lines for the past few years and Atomic enhanced their product to make it even better than before. With a more performance oriented fit that is snug, but comfy and a memory fit heater activated liner, your foot acts as it's own heater to stay warm and responsive in a variety of temperatures. If you are an intermediate skier that wants a boot that you can strive in and that's comfy, this is it.